Test: TIG & Arc, GTAW, ARC. TT – 01: Welder Qualification Test by us as per ASME Sec. IX or AWS D 1.1 in SMAW process any position. TT – 02: Welder Qualification Test by us as per ASME Sec. IX or AWS D 1.1 in GTAW process any position . The advent of digital technologies has transformed the business operating models of enterprises. The focus has shifted from decent product functionality to better end user experience. Trade tests are conducted for all technical professionals such as technicians, electricians, welders, plumbers and mechanics etc. We provide proven, cost effective and optimum trade testing methodology for clients wanting to perform competency evaluation on prospective employees for various trades. - Trade Test Facility for recruitment of Manpower in Various Industries. The short listed candidates are called for an interview. They are interviewed by our selection panel and the representatives of our clients. 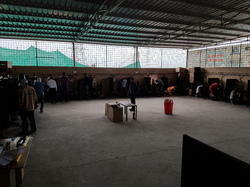 They subject the candidates to a trade test to check the authenticity of the trade of the candidates.